Widget for browsing your iPhoto library. Is there a better alternative to iPhoto Mini? Is iPhoto Mini really the best app in System category? Will iPhoto Mini work good on macOS 10.13.4? 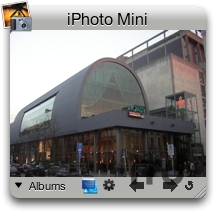 iPhoto Mini is a widget that lets you browse your iPhoto library. You can select an album and look at the photos in that album. Additionally, in the album popup menu you get to see how many photos each album contains. The photos are automatically rescaled so they always fit in the viewing area. iPhoto Mini needs a rating. Be the first to rate this app and get the discussion started!